Concrete Expansion Joints - What Is A Concrete Isolation or Expansion Joint? Concrete expansion joints, also referred to as concrete isolation joints, are a very important part of designing and building concrete slabs. 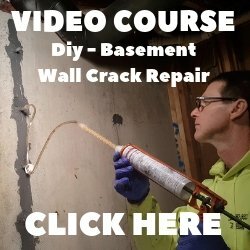 Concrete cracks because it is weak in tensile strength, so when its natural tendency to shrink is restrained, tensile stresses that exceed its tensile strength occur, resulting in cracking. Concrete isolation joints provide relief from the tensile stresses that cause uncontrolled cracking in concrete slabs by allowing the concrete to move freely as it shrinks or expands. Concrete expands and shrinks with changes in moisture, humidity, and temperature. The overall tendency is for it to shrink, which can cause cracking at a very early age. Although shrinkage cracking doesn't usually affect the integrity of the concrete, the irregular cracks aren't pretty to look at. Installing expansion joints in concrete permit independent horizontal and vertical movement between adjoining parts of the structure and help minimize cracking when such movements are restrained. Concrete isolation joints, or expansion joints, separate or isolate the concrete from other parts of the building structure like walls, footings, columns and piers. 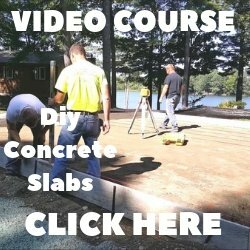 A concrete expansion joint is also used to separate a concrete driveway or patio from a garage slab, sidewalk, stairway, light-pole or any other point or restraint. The materials used for expansion joints are asphalt-impregnated fiber sheeting. You can buy these 4' x 8' sheets and cut them to the width you need or you can buy pre-cut strips that are 4" or 6" wide by 10' long. We usually use a spray adhesive to attach the material to the wall, you can also use small concrete nails or caulking. Another popular isolation joint material is Iso-strip-off. 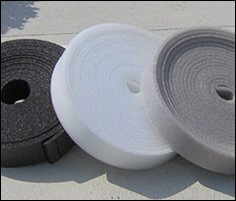 This compressable foam strip comes in rolls 50' long and multiple widths from 3", 4", and 6". We use 3M stick-on spray to attach the foam to the wall, you can also use small concrete nails or caulking. 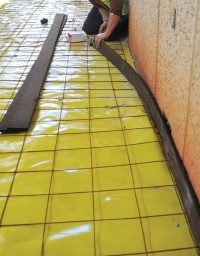 Taking the time to install expansion joints will be well worth the effort it takes. Reducing the amount of random or shrinkage cracking in your slab will make it look much nicer. To help further reduce random cracks in concrete read about concrete construction joints and concrete contraction joints.